July Fourth holiday boating traffic is likely to be up this year, with national boating group, BoatUS, urging extra safety efforts. The American nation’s largest advocacy, services and safety group for recreational boaters, Boat Owners Association of The United States (BoatUS), says July Fourth is shaping up to be the busiest time of the year on the water for the nation’s recreational boaters, with boating traffic potentially surpassing last year’s levels. This also means boaters will face additional safety concerns with waterway congestion and nighttime operation. In a recent survey of more than a half million BoatUS members, 88 percent of respondents say they are “very-to-extremely likely” to go boating during the 2017 July Fourth holiday period (June 30 through July 9). That compares to 73 percent who went boating over the similar period last year. 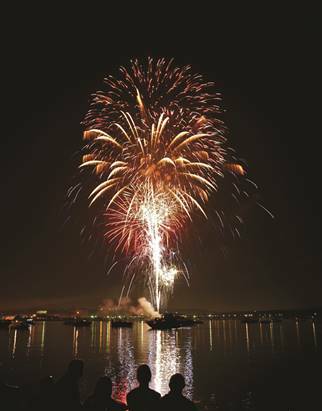 The BoatUS member survey also shows that about one in three (36 percent) of respondents are “very-to-extremely likely” to operate a boat at night to view a July Fourth fireworks display from the water. Three percent said that fireworks displays are the only reason they will venture out after dark all year long. Wait to celebrate with alcohol. It could be a long day on the water, but waiting until after you’ve returned to homeport for the night before celebrating with alcohol is a wise move. Added to the effects of sun, wind and waves, alcohol lowers situational awareness and increases reaction times. The more lookouts at night, the better. Having extra sets of eyes – family members or guests – can help prevent accidents. Go slow after the fireworks. 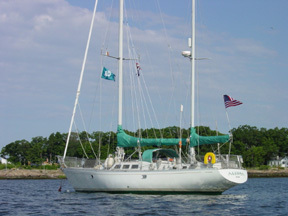 After viewing fireworks from the water and pulling up anchor, you may have the urge to rush home. Don’t. Slow down. Be cautious, and the odds for a safe return increase. Get kids’ life jackets for free. Everyone has extra guests this time of year, but they don’t always have properly-sized life jackets for everyone on board. The BoatUS Foundation’s free Kids Life Jacket Loaner program gives boaters a chance to borrow child-size life jackets for the day, afternoon, or weekend. Don’t overload the boat. Everyone should have a seat inside the boat, and be careful about adding extra coolers and gear. It’s also a bad idea to allow to passengers to ride on the top of a boat with an enclosed bow while underway. Be a safe paddler. Kayak, canoe or stand-up paddlers should understand all of the nautical rules of the road, practice defensive paddling and assume no one can see you. At night, paddlers are required to show a white light – colored glow sticks around the paddler’s neck don’t cut it. Avoid crowded anchorages and congested ramp areas. Never swim near a dock with electricity or in a marina or yacht club. Avoid the two biggest hassles. The nationwide TowBoatUS on-water towing fleet traditionally reports hundreds of battery jumps and anchor-line disentanglements over the holiday. To avoid having to contact BoatUS 24-hour dispatch (BoatUS.com/app) monitor your battery drain, go slow while hauling anchor line, and be super vigilant so you don’t run over someone else’s anchor line after the show ends.